Our Spring Into Action 2019 webinar series will inspire, inform and engage each and every one of us to step up and take action on climate change. This year you will hear from national experts and activists including the youth who will change the world through their activism; Project Drawdown which is the most comprehensive response to climate change; and hear proposed energy policies that can lead us to a low carbon future. You will not be disappointed in the spring webinar series. Webinars are free and open to anyone of any age to participate. We do appreciate a donation, no matter the size to help us grow this movement of elders. A number of Youth Climate Organizations are mobilizing kids to take action on climate change. 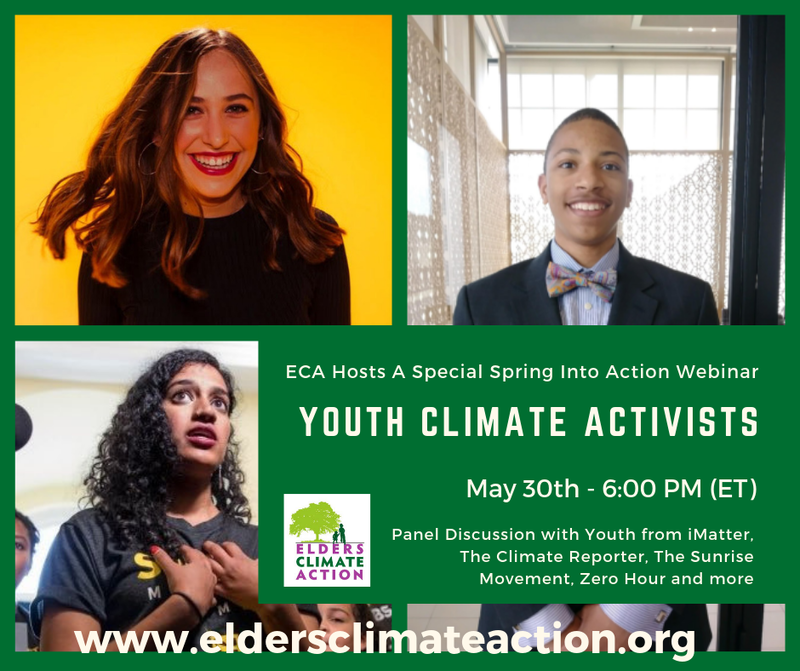 In this panel discussion we will include youth climate allies from Our Children’s Trust, the Sunrise Movement, The Climate Reporter, iMatter and Zero Hour.